snowdeal.org > ex machina: the eric update - day 302: soooooo close to crawling! 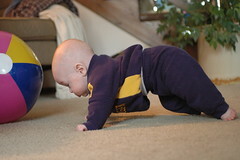 the eric update - day 302: soooooo close to crawling! "hmmmmm." little odin seems to thinking, "that colorful beach ball is way more exciting than crumpled paper! let me take a closer look." 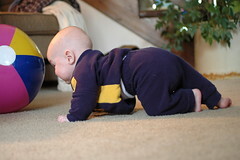 as soon as he got a good look at the ball, he started as earnest attempt as i've seen yet to crawl towards it. it's so exciting to see him so spectacularly close to putting all the pieces together to finally be able to get to where he wants to go all by himself. i think we had better get going on "babyproofing" grammy pam's house, because i don't think it'll be too long before he's crawling himself into all sorts of fun adventures! first he tries tucking his left knee up and pushing off with his right leg. and then, quite naturally, he decides that maybe pushing off with his left leg might help him reach his goal. then after trying to push off with one leg and then the other, he tucks both underneath of himself and repeats the process. but alas, he hasn't quite figured out how his arms are supposed to move and he stays in pretty much the same spot - sometimes moving an inch forward and sometimes an inch backward. maybe it didn't help that i was laying on the floor yelling encouragements which was probably just distracting him. 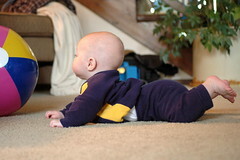 he seems to enjoy crawling on grammy pam's carpet lots more than he ever liked crawling on wood floors. i guess we shouldn't be too surprised since carpet is so much fun to dig your toes into. 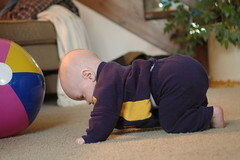 I thought my second baby would never crawl -- he kept doing this "downward facing dog" thing with his hands and feet, but not knees, on the floor. Then we took a vacation for a week in a place with wall to wall carpeting. He came back crawling. I guess he just wanted to do his learning in a spot that was a little more forgiving. Way to go Odin!!!! I bet it won't be too much longer and you'll be keeping your Mommy and Daddy on their toes all the time!